Proudly Designed and Handcrafted in the USA WORLD-WIDE SHIPPING! 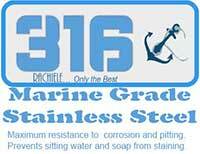 All Stainless Sinks will be Hand-Crafted of Domestic 316 Marine/Medical/Food Grade stainless steel. "Congratulations; Evolution Copper Sink has been recognized by Design Journal and Archinterious as one of the best products of 2014." Our	customer	service	has	been	recognized by Houzz.com. We	are	blessed with	well over 120 Five star reviews. The Evolution sink is for those who must have the best of the best! I have put my 40 years of design experience into the formulation of what I believe to be the most useful kitchen food prep and entertainment sink design ever developed. I considered ergonomics, food preparation, clean up, serving and aesthetics. I truly believe this is the consummate kitchen sink - especially in an island setting. The architecture of the sink, is clearly perfection in design utility. 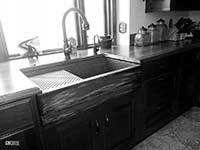 The Evolution Sink - a sink for all occasions Food prep, clean up, serving, and additional counter space. Today, the kitchen sink has finally evolved to attend to our current lifestyles. Our fast paced lifestyle deserves a kitchen sink that can do it all, quickly and efficiently. Do you have a small kitchen and think this sink is too large? Think again... This sink adds valuable counter height work space in your kitchen. There is no loss of space. You actually gain usable work space! Look at the photo to the left. There is hardly any counter top on either side, there is no need! 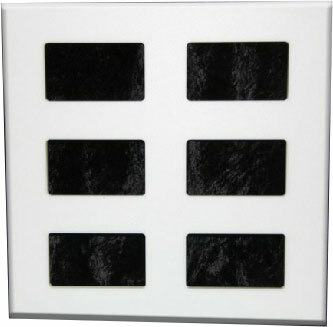 The Evolution can be the crown jewel in your home. 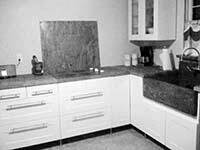 Each sink is custom designed to suit the user based on many things including handedness, and height. I believe this type of sink is best suited on an island. My new NexGen sink is a far better alternative for sinks facing a wall. I also believe the Evolution sink works best when it is 54" or larger. That being said, we have built plenty of 48" models. Oh, I must say that when my mother watched the video below of me cutting vegetables, she said "Where did you learn to cut with a knife??? You are going to cut a finger off!" 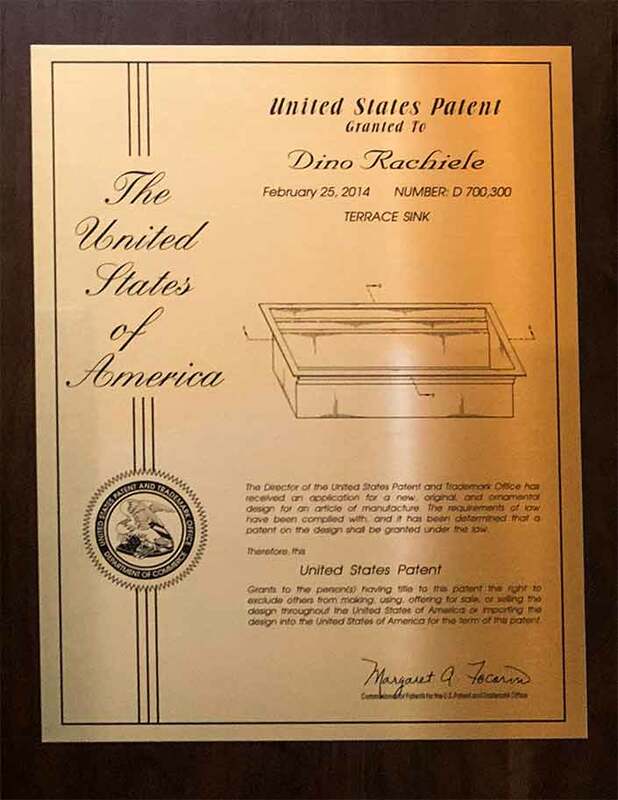 Three patents have been granted and there are more pending. 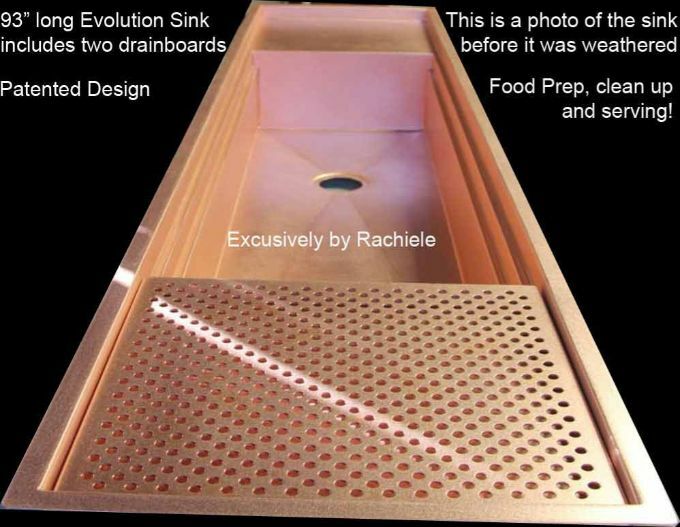 The Rachiele "Evolution Sink" is now available on a limited basis. 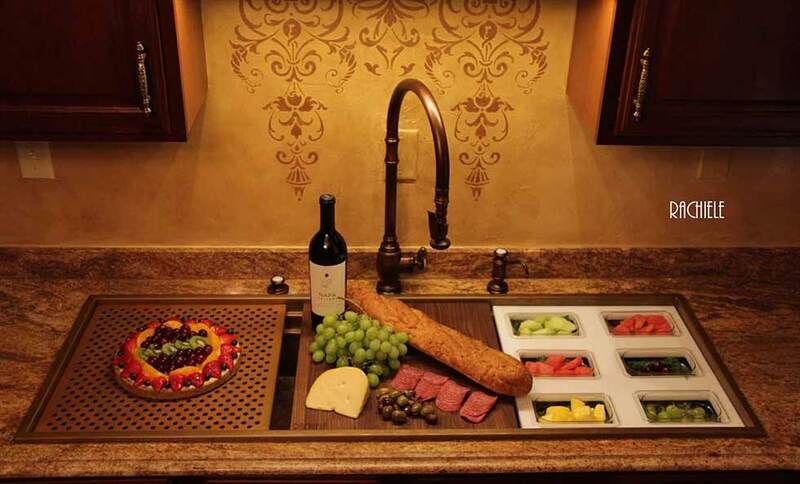 If you love to cook and entertain (like I do) you will love this sink! Don't be fooled by other sinks offering similar designs. Ours is the only sink on the market with two interior ledges and a front to back dimension that allows you to put a faucet behind the sink in a standard countertop. There really is no comparison with the Galley and my Evolution sink. The Galley sink is virtually the same design as my original single tiered Signature Series Sink (a design that preceded the Galley Sink). They simply made the flanges wider and exposed a portion of the flange as their top tier. I have never offered that option with my Signature Series design because there is no way to keep water from sitting on that ledge unless you wipe the ledges down after every use. I believe it to be an inferior design. I do have to give the Galley Sink folks kudos though. Their brilliant presentations are stunning and their videos and photos are second to none. I don't have nearly the budget for such fine promotional work as they appear to have. (Yes, I am a bit jealous) They also seem to have a wonderful reputation - always a good thing to hear. Truth be told, one of my past customers asked for the serving tray option that the Galley sink has. I, however, believe I improved the design to offer clear polycarbonate trays and lids, instead of stainless steel, so you can see what is inside the trays when the lids are on. The interface between the sink and the countertop must be sealed. The sealant may discolor or mildew over time and it may leak without giving much notice to the user. In my opinion, it is a poor design. Any sink with two interior ledges is copying my patent and trademarks without permission. My Evolution sink has two interior tiers. That is the main reason that distinguishes us from all other legally produced sinks on the market. One of my patents shown below. Thoughtful design is key. (This is where my background as a kitchen designer paid off) All of the accessories for my sink are universal, meaning, you can turn them 90 degrees to fit the lower tier or the top tier. This cuts down the amount of accessories in half. The grid is designed, and included, as a universal accessory. The White Butcher quality Cutting Board accessories with holes for colander or bowl, and the polycarbonate dish trays are also universally designed. You may also want an optional 12" wide (not universal) Butcher quality cutting board so you can easily place it in the dishwasher for sanitizing. Evolution sinks are individually handcrafted using precision tools. They are not mass produced. In fact, every sink design is customized to the user(s). 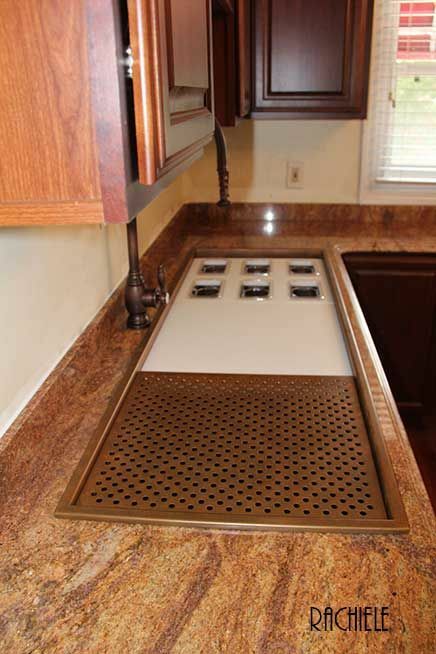 The non drain side is shallower than the drain side; plus all portions of the sink are sloped to the drain. This guarantees proper evacuation of water (a common problem found with other large sinks). Every sink is tested for proper water evacuation before finishing. Each sink is signed by all metal workers and by Dino. Every Evolution sink carries a distinct limited production number shown on a certificate that accompanies the sink. 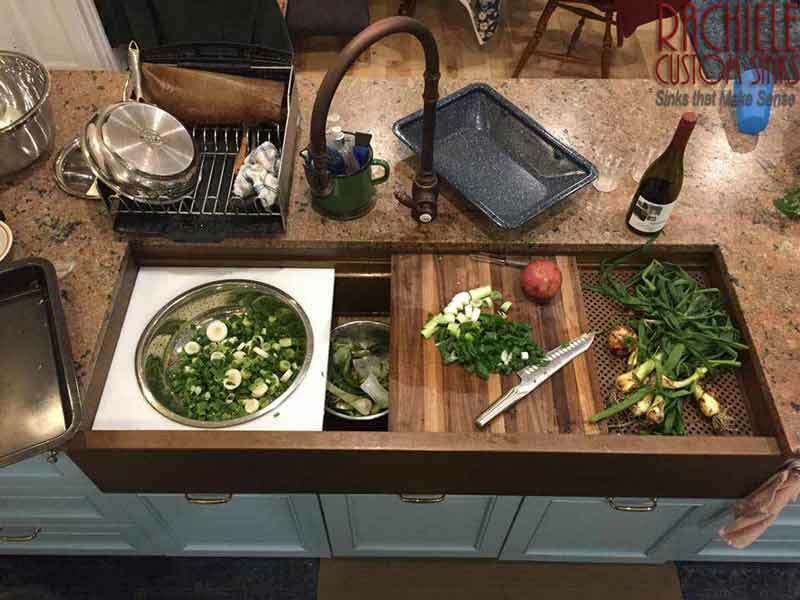 Each sink includes: Walnut cutting board, White Butcher Cutting Board, Poly platform for serving trays, 6 serving trays with lids, Poly platform for colander and mixing bowl, Stainless mixing bowl, Stainless Colander, and a copper or stainless perforated grid. Each piece will fit the top or lower tier by turning it 90 degrees. We can build the Evolution sink in any of the 6 stainless steel options as well. This is a top mount Evolution sink. The sink is 54" long. In my opinion, this is the smallest ideal size for this type of sink. This is what a copper sink looks like prior to our artist applying a natural patina. 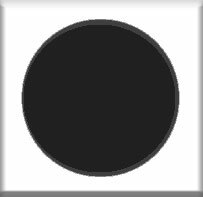 The shading differences in the below photos has to do with photography. All of our optional accessories fit on the top and the bottom tier or terrace simply by rotating them 90 degrees. The pans in this sink will are crystal clear polycarbonate pans with matching lids. Keep things fresh in the refrigerator! Copper grid is on the bottom tier in this photo. This photo illustrates the grid on the top tier. Stainless mixing bowl fits either tier as well. Cut your veggies on a cutting board and scoop into the bowl below. How about a colander? This is just getting to be too much fun! I have been dreaming of this sink for months. Now... perfection! 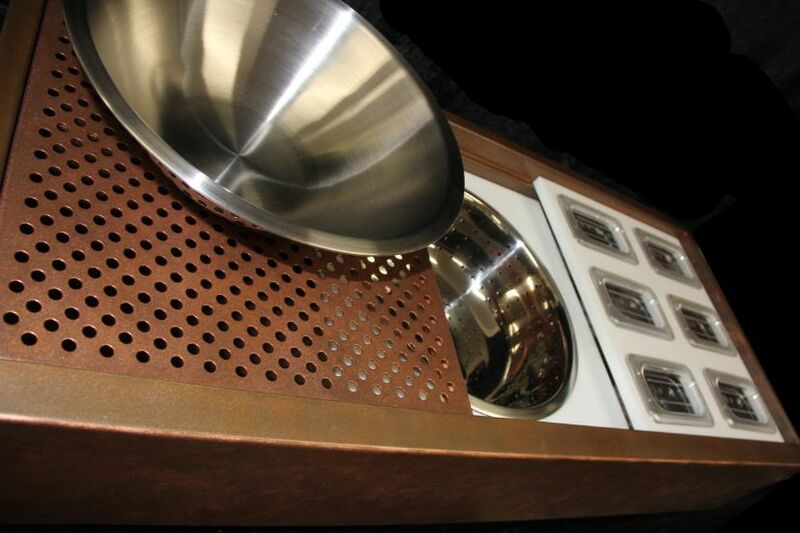 Showing the colander on the bottom tier, the food tray shelf on the top and the copper grid on the top tier. This is an under mount Brushed Stainless Steel Farmhouse 48 inch Evolution Workstation Sink. This is an under mount Millennia Stainless Steel 57 inch workstation sink. Showing the walnut cutting board (turned 90 degrees) on the bottom tier. This 13 qt. heavyweight mixing bowl is made of heavyweight stainless steel that has an elegant mirror finish. It is easy to clean and dishwasher safe. Food preparation is much easier when you have the right tools. Whip cream, knead dough, toss salad, and mix batter in this durable 13 qt. stainless steel mixing bowl that stacks for convenience. It gives you beauty and style in just the bowl you need for almost any kitchen job. This 13 qt. heavyweight mixing bowl is the perfect tool to begin the preparation of many great meals your family has come to expect. The 13 qt. mixing bowl measures 15" in diameter x 4 1/4" deep. This 12 3/4 qt. colander made of .5 mm. stainless steel and featuring 4 1/2 mm. holes. It is easy to clean, comes with tapered sides and beaded edges, that make it easy to handle. This colander is 15" in diameter. Poly Board for the above two items. Made of crystal clear, shatter-resistant polycarbonate, this food pan and lid can withstand temperatures from -40 to 212 degrees Fahrenheit! 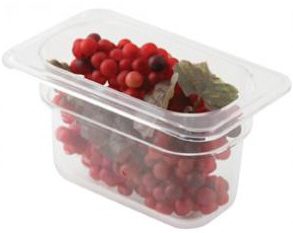 Its see-through design makes it great for storing and serving every kind of food from sauces to vegetables and more. The durable polycarbonate material also resists food acids and oils to maintain its attractive appearance. Poly cutting board with 6 holes for rectangular food pans. Board measures 17 7/8" by 16 7/8" and can be turned sideways to fit lower shelf. I have to give credit to the Galley Sink company for this idea. One of my customers described this to me without telling me where they got the idea. I hunted down polycarbonate trays, which in retrospect, I like better due to the ability to see inside when the lid is on. Two levels of work surface below the counter top. I have several patents on this design. Adjust to your comfort level. Merely turn each accessory 90 degrees and it will fit the second tier. All accessories can be universal in that way. 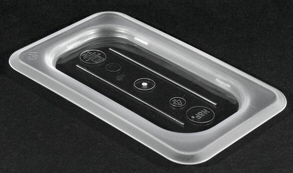 This photo shows a partial grid on the left, a poly cutting board sitting on the grid, then a lower level mixing bowl, and to the right a poly board with six polycarbonate serving trays. If you want my honest opinion on the optimal size for this sink, I would say 54" to 60" Yes, you heard me correctly. This can be a food prep, clean up and serving center - all in one! 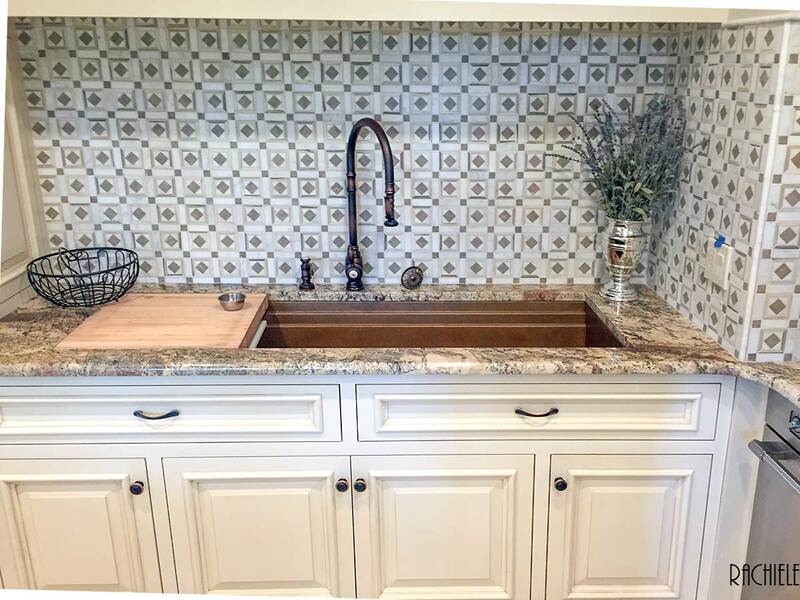 If you have an island in your design, consider an Evolution sink. Drop in Evolution sink with grid, cutting board on top level and a mixing bowl on the second level. Place your food on the grid (like chicken - all the chicken juice runs into the sink), take a piece and cut it on the cutting board then scoop into the mixing bowl. 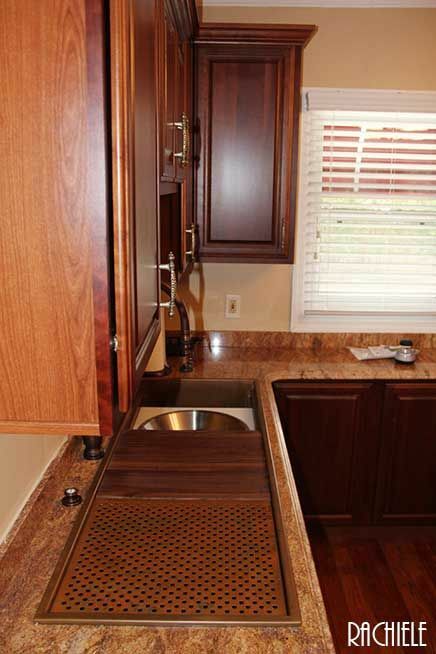 This is a photo of a 93" Evolution sink with two drainboards. The main sink area is 54" long. This is an under mount sink. The photo was taken prior to the patina process.
" 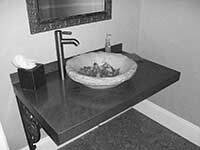 I would recommend anyone who would like to have a sink designed, and produced correctly, Rachiele Custom Sinks is the place to go." George Hong Shop Now!